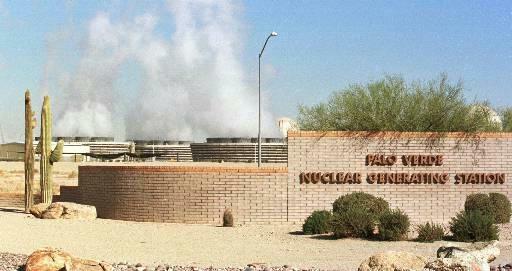 Publimetro: Insulation fire reported at Arizona nuclear plant. Insulation fire reported at Arizona nuclear plant. PHOENIX — The Palo Verde Nuclear Generating Station declared an unusual event when oil-soaked insulation behind a water pump caught fire, officials said Tuesday. The Monday night fire did not interrupt power production at the three-reactor plant located 50 miles west of downtown Phoenix, and Arizona Public Service Co. said the plant continued to run normally Tuesday. An unusual event is the lowest of four emergency levels for nuclear power plants. APS told the federal Nuclear Regulatory Commission that there was no release of radioactive material and no threat to public health or safety. APS spokesman said the cause of the fire is under investigation, but NRC spokesman Victor Dricks said it appeared that insulation that covers very hot metal surfaces had become soaked by bearing lubrication over time. APS' notice to the NRC said the fire occurred in the insulation behind a pump that feeds water that becomes steam as part of the power generation process and that a small leak of oil vapor was found in a high-pressure seal. Palo Verde firefighters responded when a security guard spotted smoke in a turbine building of Unit 2. The fire was declared out 45 minutes later. APS and another Arizona utility, the Salt River Project, own the plant along with Public Service Co. of New Mexico, El Paso (Texas) Electric Co, Southern California Public Power Authority, Southern California Edison Co. and the Los Angeles Department of Water and Power. Dricks said NRC inspectors went to the plant after the unusual event was declared and verified that APS was handling the incident correctly. The unusual event was the second at Palo Verde in two months, but Dricks said that wasn't troublesome because the incidents were unrelated. The last unusual event was on July 2 when Unit 1 reactor temporarily reduced its power production after there was a minor explosion in a cabinet that holds electrical switching gear.